Description: At dawn June 9, the Union cavalry corps under Maj. Gen. Alfred Pleasonton launched a surprise attack on Stuart’s cavalry at Brandy Station. After an all-day fight in which fortunes changed repeatedly, the Federals retired without discovering Lee’s infantry camped near Culpeper. This battle marked the apogee of the Confederate cavalry in the East. From this point in the war, the Federal cavalry gained strength and confidence. 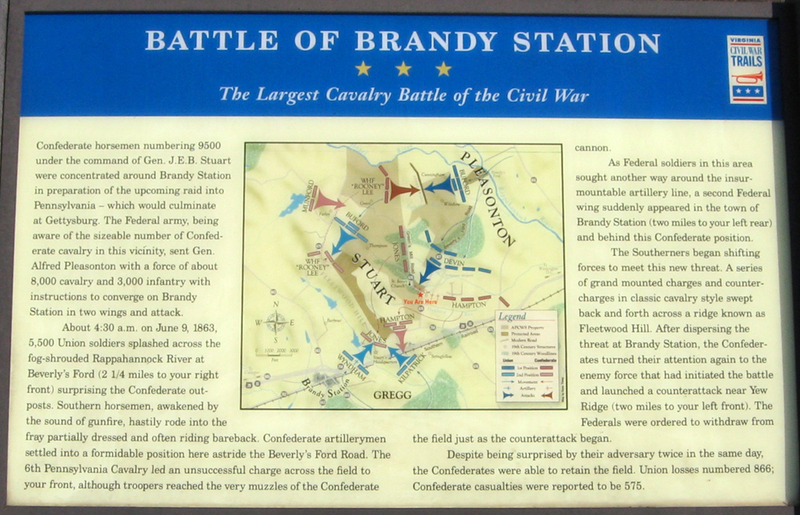 Brandy Station was the largest cavalry battle of the war and the opening engagement of the Gettysburg Campaign. The duel was also the largest cavalry engagement ever conducted on American soil. See Battle of Brandy Station and Civil War Cavalry and Brandy Station: Union and Confederate Weapons, Uniforms, Roles, Tactics, and Organization. He then examines the development of tactical plans and the deployment of troops for the approaching battle. But the emphasis is on the fighting itself. Pfanz provides a thorough account of the Confederates' smashing assaults—at Devil's Den and Little Round Top, through the Wheatfield and the Peach Orchard, and against the Union center at Cemetery Ridge. He also details the Union defense that eventually succeeded in beating back these assaults, depriving Lee's gallant army of victory. Pfanz analyzes decisions and events that have sparked debate for more than a century. In particular he discusses factors underlying the Meade-Sickles controversy and the questions about Longstreet's delay in attacking the Union left. The narrative is also enhanced by thirteen superb maps, more than eighty illustrations, brief portraits of the leading commanders, and observations on artillery, weapons, and tactics that will be of help even to knowledgeable readers. Gettysburg—The Second Day is certain to become a Civil War classic. What makes the work so authoritative is Pfanz's mastery of the Gettysburg literature and his unparalleled knowledge of the ground on which the fighting occurred. His sources include the Official Records, regimental histories and personal reminiscences from soldiers North and South, personal papers and diaries, newspaper files, and last—but assuredly not least—the Gettysburg battlefield. Pfanz's career in the National Park Service included a ten-year assignment as a park historian at Gettysburg. Without doubt, he knows the terrain of the battle as well as he knows the battle itself. Recommended Reading: The 1863 U.S. Infantry Tactics: Infantry of the Line, Light Infantry, and Riflemen (Hardcover) (608 pages). Description: Written in 1861 at the direction of the War Department and copiously illustrated, this was the book used to train, lead, and maneuver U.S. Infantry units on Civil War battlefields. It contains the school of the soldier, the company, and battalion or fielded regiment, along with all-important instructions for skirmishers. More than 15 pages of field music, the articles of war in use at the time, and a dictionary of Civil War military terminology complete this extensive work. The work was authorized and adopted by the Secretary of War on May 1, 1861. This is the second edition issued in 1863. More than 15 pages of field music, the articles of war in use at the time, and a dictionary of Civil War military terminology complete this extensive work. The work was authorized and adopted by the Secretary of War on May 1, 1861. This is the second edition issued in 1863.